Skiing with children can be such a rewarding experience for both the child and yourself. Watching them learn new skills, take on the challenge of the mountain slopes on their own and being able to join in family ski holidays are some of the best feelings! There are people of all ages skiing on slopes, not surprisingly, many of which seem to be getting younger all the time! 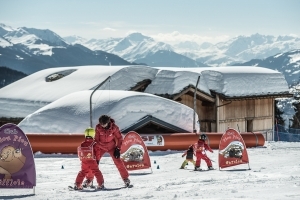 Normally we suggest that you take your child to the professionals whn it comes to teaching children how to ski, however, if you are an experienced skiier, we have some basic starter steps to give your child an upper hand. Socks, boots, skis, poles, goggles, helmet, gloves, fleece, ski jacket & salopettes. This one starts off of the slopes. Help your child put on the ski equipment by showing them how to. Have them stand on a soft floor while they put on their ski gear. Give him time to get used to the feel of the equipment. It's always really helpful if you can get them to walk in the ski boots to practice keeping their balance. Making sure this is done for the first time before they hit a slope is important, so they are used to wearing it all together before skiing. Drive to a ski centre or dry slope (preferably ski centre where there is artifical snow). If there is a small hill to use, take your child there before going to a larger hill. Show your child how to use the poles to go forwards through the snow and glide on the skis. At this early stage it's important to keep an eye on the balance. If your child needs some help eith balancing on skis, you can practise by lifting one ski in the air, whilst standing on the other for several seconds at a time, then alternate. If you are at a ski slope, you could try to ride the ski tow/ski lift to the top of the beginner hill. Go through the snowplow technique to make sure they can stop/slow down. Best way we know how to explain is "Make sure they bend their knees slightly and point your toes together so your skis form a "v" shape". Encourage the child to practice this pose on level ground until they feels comfortable enough to try it out for real. It is always useful to go through it with your child so they can see what they are meant to do. When your child is ready, tell them that they are going to try and ski down the hill using the snowplow technique. To be safe, go no more than 10 feet down the hill to start with. When they are ready, tell them to ski down the hill using the snowplow technique. Repeat this process until they are happy and comfortable with snow-plowing. If they need more or less distance, you can move accordingly. If the child seems confdient and the skills are there, you may want to teach your child to turn on their skis. Show the child how to lean their weight to one side, placing more weight on one ski to help pivot the ski. Show the child how to help make the turn by digging in with one ski pole and pushing to the opposite side. Build up to a point where your child can descend a small hill stopping several times, then build to fewer stops. If they are taking well to skiing, they may even try to go down the beginner slope without stopping, however, it is improtant not to rush or get ahead of yourself! Another helpful tip is to ski down the hill slowly and have your child copy your turns and movements behind you. Enroll the child in a beginner’s ski class at a ski slope to learn more advanced downhill skiing techniques. Before you know it, they will be competant and be able to join the family skiing on the slopes for real!